It is one thing for Adblock Plus to write a blog espousing the wonders of our product. But when we have an opportunity to talk about a third party coming to that conclusion, it puts a little extra wind in our sails. According to a new study spearheaded by the University of California Santa Barbara, Adblock Plus is the best way to stop malvertising in its tracks. 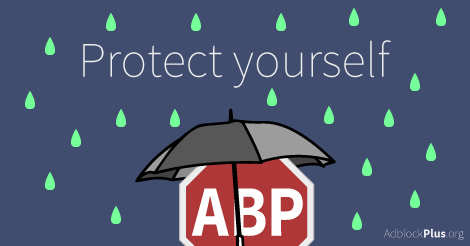 While 2014 has seen a surge of malvertising (online attacks that inject malware-laden ads into ad networks), Adblock Plus provides the last line of defense to help protect users from malware-carrying ads before they are even served. We’ve been advising users of this benefit for a while, and it’s nice to know that now others are too. The report, entitled ‘The Dark Alleys of Madison Avenue: Understanding Malicious Advertisements,’ concluded that: “Finally, the safest way for users to protect themselves against malvertisements is to utilize solutions like Adblock Plus to prevent advertisements from being delivered to their browsers.” Conducted by an international group of computer scientists from UCSB, Germany’s Ruhr-University Bochum and the University College London, the study analyzed more than 600,000 real online ads to find examples of malvertising. They found malicious ads in around 1 percent of the ads (6,601 incidents). Since January of 2014, over 5,000 filters that block ads that are potentially malicious were added to the base list used by Adblock Plus. That is a 15 percent increase in the amount of filters contained in Adblock Plus’ EasyList. EasyList is run by the open source community and is a collection of filters that automatically remove annoying ads from the Internet. We’ve seen a spate of malvertising incidents over the past year. There were the Yahoo/AOL attacks, assaults on the political front as well as strikes aimed at ad networks, the US military, and Amazon and YouTube. From all indications this attack vector is just too juicy for the Internet’s ne’er-do-wells to quit … which is more than a little disheartening going into a new year. Even though 2015’s malvertising miscreants may indeed be hatching even nastier threats than the worst 2014 had to offer, there are a number of ways to protect yourself. For instance, malware protection software and our anti-malware feature are two other important defense mechanisms in a healthy repertoire. Here at Adblock Plus we’re happy to provide you with what we feel is the easiest, most direct tool to browsing malvertising-free. I’m so excited that the world is finally starting to see how much damage that sketchy ads can cause to users who might not be technically inclined. The use of Ad Block Plus is an amazing invention that now allows for us (the user) to have a safer more natural internet browsing experience. Finally, it is a pleasure to browse the internet, even if the sites are in French or other languages. It weighs less pages so navigation is faster. Everyone should have this App. or set automatically when purchasing a computer. both Mac and PC. I am using it at my page and now its a peaceful page! Oh My.. That was really annoying! Now stopped all those annoying ads coming in! Thank you so much ABP for your timely intervention! I just shared about this wonderful service to my social networks like fb, twitter, G+ etc. Yes i agree with them i have installed ad block plus extension in my chrome browser it works perfectly protecting from harm viruses and malvesting sites such as adult content etc. It should be on Mozilla browser too.